Sheet metal bend allowance calculator - formula & step by step calculation to find the flat pattern length when a bend is dimensioned either from the centre of radius or a tangent point of radius or the outside tangent point of the radius on an acute angle bend. BA = [A x (π/180) (r + (K x T))]. The bend angle A in degrees, inside bend radius R in m, K-factor K for different types of materials & material thickness T in m are the key elements of this calculation. In mechanical engineering, the below mathematical formula is used to calculate the bend allowance of any material. In the field of mechanical engineering, sometime, it's important to analyse the bend allowance of materials. 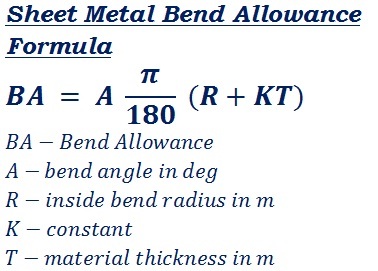 The above formula & step by step calculation may useful for users to understand how the values are being used in the formula to find the change in material's bending allowance, however, when it comes to online for quick calculations, this sheet metal bend allowance calculator helps the user to perform & verify such calculations as quick as possible.